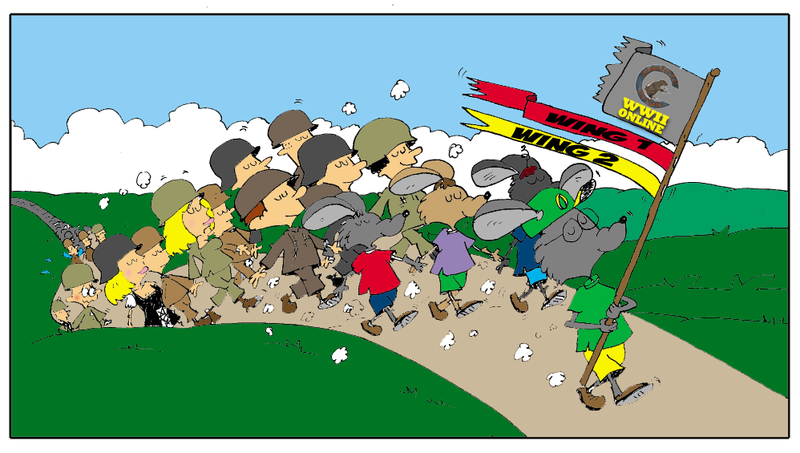 The big day is here and it’s time to show you what’s happening for 2018 at WWII Online and Cornered Rat Software! 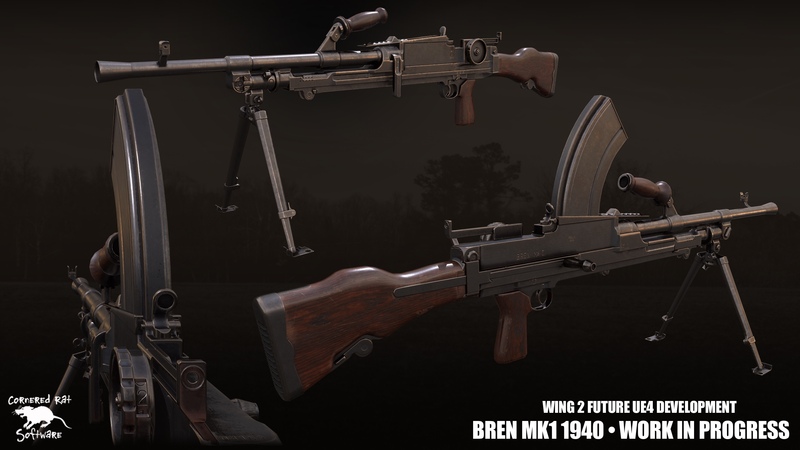 From completing some last remaining items in our 2017 roadmap, to several new vehicles, enhancing the software to a 64-bit version, redoing our user interface and getting the hybrid supply system in order, and the beginning stages of creating a new development Wing at CRS to move our graphics and assets to into the future. Okay everyone, get the popcorn ready, HERE WE GO! One of the most important things for our new team at Cornered Rat Software is to continuously deliver on the promises that we make to you. Internally we have something we like to go by, “Under promise – Over deliver.” While sometimes we cannot always make the timelines we set (because we’re a mostly volunteer team at this stage) we do our very best and take seriously following through. So the first part of this Roadmap is of course dedicated to showing you the things we did complete, and then how we’ll be prioritizing the items that require completion from 2017. We released on Steam September of 2017. This absorbed a substantial amount of time with all departments. Updated lots of old legacy art work. Massive increase in bandwidth (factor of 10). Several new servers, components and wires added to colocation. With those 2017 items coming to a close pretty rapidly, we wanted to focus on a couple of very important priorities that have been in progress for a bit now. We engaged heavily with the community and even our people internally about our original plans for 1.36, and we’ve made some changes that we think are going to do better to meet the best of both worlds, that being town based supply and what we know today with TOE’s / Brigades. We know that there are some issues with High Command officers and players have to do to keep the current system running, for those of you stepping up to HC and holding the line (we salute you big time!). But it’s our duty to make some changes and do the very best we can so that we set you up for success. So here are some short notes about what 1.36 will be about (now) and why this will have a very big impact on game play. It should be noted that several of our goals as announced last year still remain, so while this may be a bit redundant (and obvious to some of you vets) we’re going to be sure to list them out again so everyone knows what we’re trying to do. Stabilizing the Campaign map during ALL time zones. Providing more supply for the players throughout the entire theatre of operations. 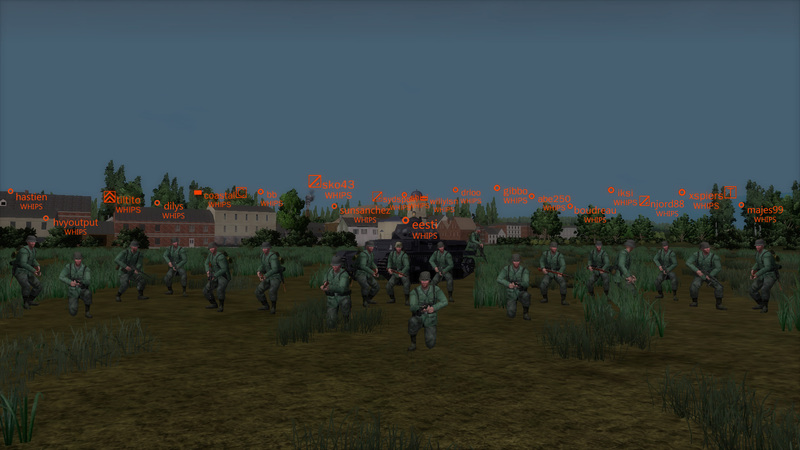 Redeploying High Command’s focus on cultivating great community relations and massive coordinated battles. Providing greater opportunity for organization via planned operations. 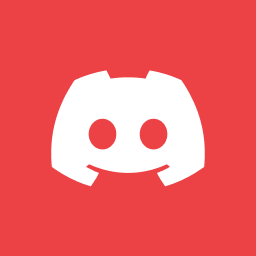 We’re looking to incorporate a newer version of web HC tools to connect with web Squad tools as well. Bring the value back to squads by incorporating them as part of the HC structure. Completely revitalize the approach with HC by enabling voting brigade leadership and upwards (minus central command). MASSIVE overhaul of the user interface so that it is easier to follow, with a better design to direct users into action and more user friendly. 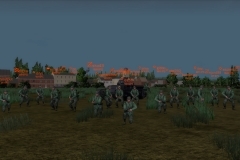 Restoring rear line re-supply and interdiction operations. Enabling garrison supply across the frontlines, and one town to its rear. Enabling the continuation of move-able flags that are supplemental (not the standard). Refactor how players spawn in to simplify the user interface. Make the movement of garrison supply based on automatic conditions according to map outcomes. There will always be a frontline with garrison supply, regardless of how the lines are presented on the map. There will always be a rear town with garrison supply behind and adjacent to the frontline town. Moving the game to 64-bit has tremendous advantages for us to expand our technologies, but even now it’s becoming ever more important. Effective September of 2018 Apple will be removing support for 32-bit applications (us) and we’re expecting Microsoft to be not too far behind that. So this is definitely getting up onto the hot plate of things for us to take care of. We’ve already been looking at the dependencies involved here and planning accordingly. 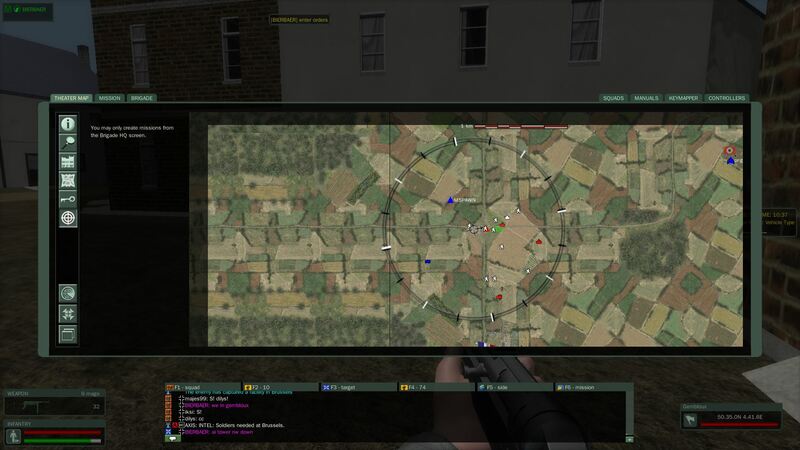 One thing that we do need to look into is our “Granny” software which is everything to do with our infantry game. This will be something we talk more about in the not so distant future with you more. We have determined what plugin we want to use and the basic design of how integrated voice comms will look inside of the game. 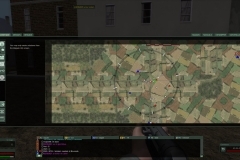 It is understood that integrated voice communication will enhance game play for new users AND veterans. 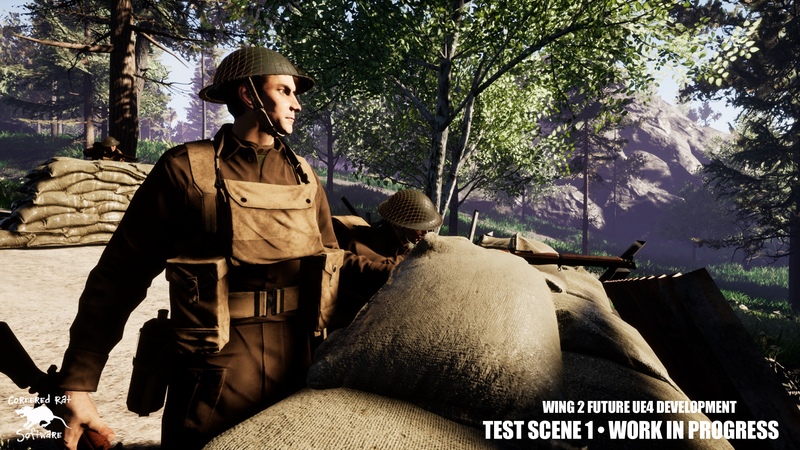 We think it’s going to tie the entire in-game operation together much more efficiently and provide the most immersive World War II Online experience to date. Users will be able to communicate directly in-game. No additional download or client is planned. Our goal is to have 3D positional audio for local communications. A radio transmit function will exist (over the net). Local Chat: Proximity based, how close you are to friendly or foe forces. Mission Chat: Be able to communicate to all participants on your mission. Mission Leader Chat: If you are a mission leader assigned to a Target, this channel would act as an organization / command channel. Squad Chat: Chat with your squad members globally throughout the Campaign. High Command Chat: Talk with fellow HC officers in-game. Disclaimer: This is according to our initial designs and is subject to change. Delivering you new vehicles to play with is a core goal for us this year and we feel pretty good with the team we have to pull together and make this happen. Here is a historical photo of the Sherman Firefly (second from the left) during Operation Market Garden. Coming to WWII Online 2018! Continuous flight model reviews and fixes. We’ve been spending quite a bit of time trying to unlock the ability to introduce terrain fixes and even expand the map. Thanks to one of our great volunteers Merlin51, we’ve learned so much about terrain building that we’ve invested some development time (pray for FRISBONE, he’s been working on this one hard) to figure out how we can take Merlin’s fixes within the TE (terrain editor) and place those into the game. We’ve still got a lot of work here but it’s getting closer and we can feel it. We’ve been taking your .reports and compiling known terrain issues around the map. Merlin has a backlog of things already fixed (if not most of them) waiting for deployment. We’ll continue to evaluate and improve any new reports or fixes to the fixes (it happens sometimes). We’ll then proceed to changing or adding the layouts of existing towns. And finally the end goal is to add more towns to the map and expand the theatre. Now one of the cool experiments that I’ve asked Merlin to personally look into is see if we can take big towns (like Antwerp for example) and carve that into different sub-cities, so for example it’d be 3 towns instead of 1 big one. Let your mind go wild with that for a moment, he’s looking into it and it might be doable which would make things awfully interesting. All in all, terrain is one of the hardest (and oldest) things to work on in WWII Online. The code base in this regard is not pleasant, so we’re going to need some grace here but we want you to know – we’re on it, doing all that we can. It is my duty as President of Cornered Rat Software to consistently evaluate how we can move the “ball” forward (so to speak) as it relates to the health and betterment of World War II Online, our great community, and the organization that is CRS supporting this effort. 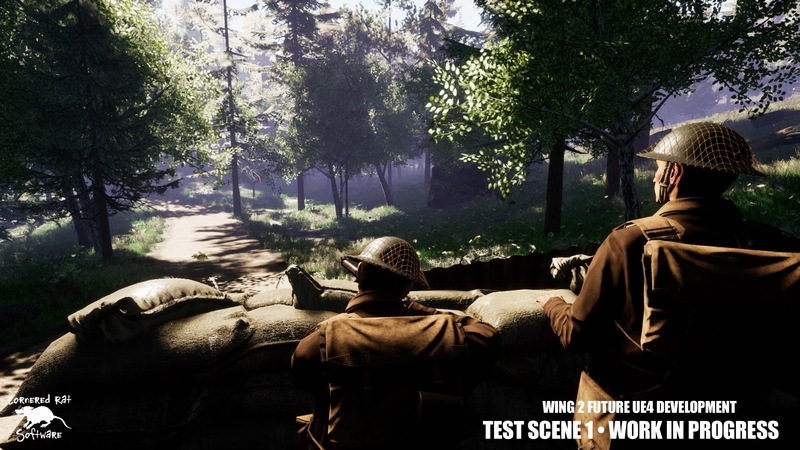 So today I will be formally announcing that I am in the process of creating a second wing (Wing 2) at CRS which will be focused on creating newer assets and getting folks involved and engaged with the Unreal Engine 4, for an eventual plan for a WWIIOL 2.0, which is still quite some time away (no estimate available, pending development speed). At some point in the future these two Wing’s will intersect. Both have the common goal of ensuring the longevity of WWII Online. Wing 1 (our current team) will continue to be the backbone of the organization and will be 100% focused on the betterment and health of WWII Online as we know it. It is a key requirement of mine to ensure active development, both in terms of adding new features and fixes to the game. 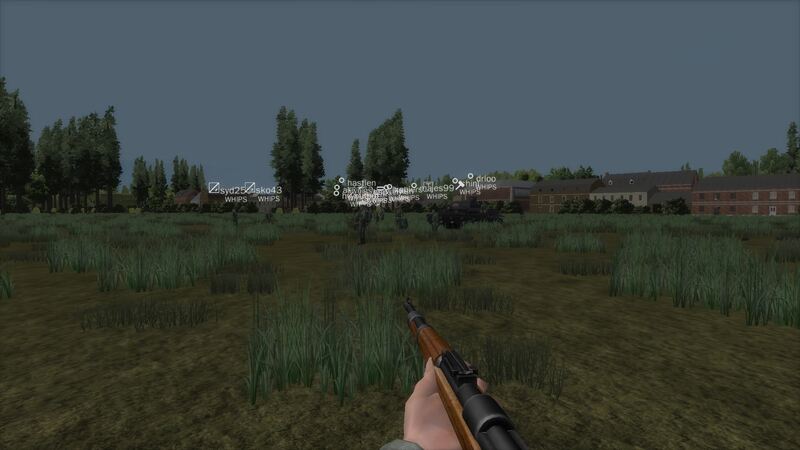 Under my leadership you can be assured that WWII Online will get the very best attention that it deserves. That being said, we must proceed into the future. During the development of this 2018 Roadmap it will require an all-hands effort from Wing 1 of CRS. It is important to me to make sure we capitalize on this time the very best we can, and I have initiated a plan that will do so without taking the foot off of the proverbial accelerator as it relates to WWIIOL 1.0’s current development. This means that we need to bring on some new resources to specifically work on new things in order to not take away from the ambitious roadmap that we’re working towards for the current WWII Online development. We’re really excited to be able to grow our team and look to the future, so this should be viewed as a win-win solution. The process has started to get in Unreal Engine 4 to become familiar with its capabilities and workflows. These images represent basic demonstrations that deal with manipulating lighting and shadow effects, advanced modern texturing techniques, substantially higher poly meshes and asset placement within a scene. You’ll notice our continued pursuit to realism in our characters, equipment and weaponry. Please remember that the following is a work in progress and does not represent the final outcome and delivery of the future. This is designed to show you the potential of how we can dramatically improve WWII Online’s assets and advance ourselves into the future as mentioned above. 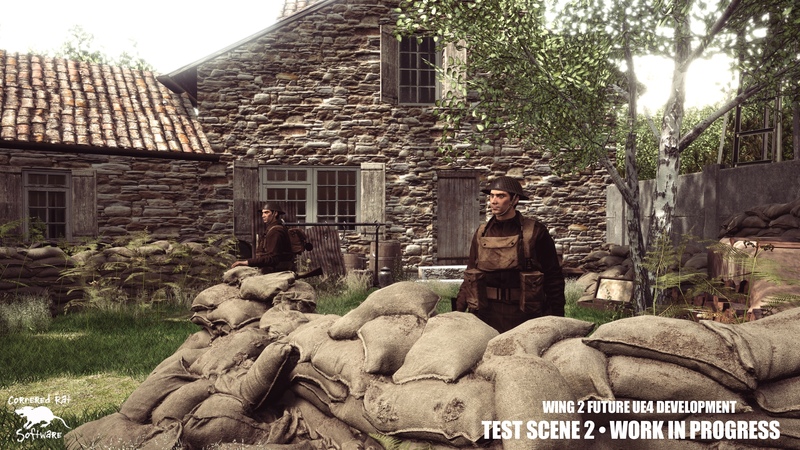 Pictured below is our first test scene. 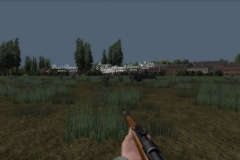 We tried to capture a British defensive position, expecting contact from the front (right). You can see a heavy influence of high resolution textures and unique lighting engine properties that bring out tremendous colors, shaders and other great effects. This is 100% the game engine. 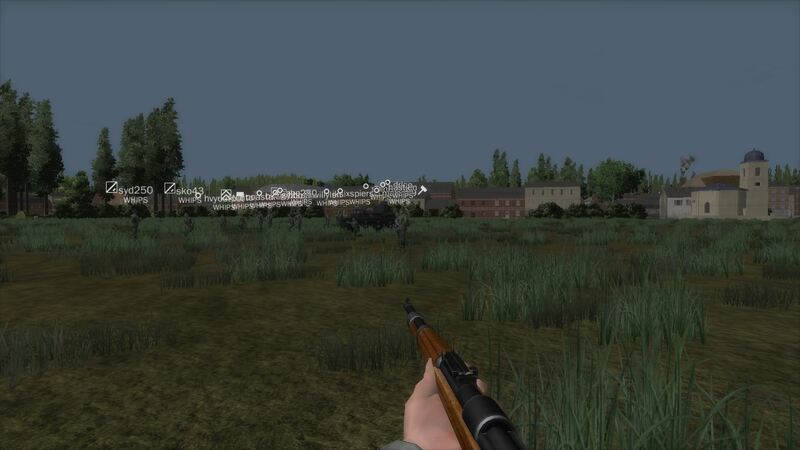 Here is the soldiers point of view from test scene 1, guarding their position and scanning for enemy movement. Pictured below is our second test scene. This was to test modifying lighting and placing a variety of different assets in the scene. 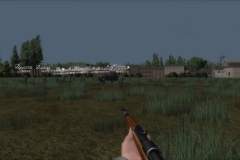 We were aiming to create a defensive position around a significant building, likely a field HQ for officers and local planning. Once again the textures and definition are pretty incredible. You can see there’s not much action for these soldiers as they’re in a fairly relaxed position, manning their post. It cannot be understated enough, that this year requires the ultimate backing of the WWII Online fanbase in order for us to sustain all of the hard work that has gone into rebuilding this new CRS team. Your subscription is very literally the lifeblood that continues this operation and it is the single sign of support (beyond moral) that has actionable effects, allowing me to do my job better and keep the great folks we have. Being that this is a volunteer thing for most, our trajectory and ability to get things done in a more timely manner is single handedly slowed down as a result of not being able to compensate these fine people working with us at CRS in a way that enables them to provide for themselves and for the game. Make no mistake, we are truly grateful for all of the support that is out there right now. 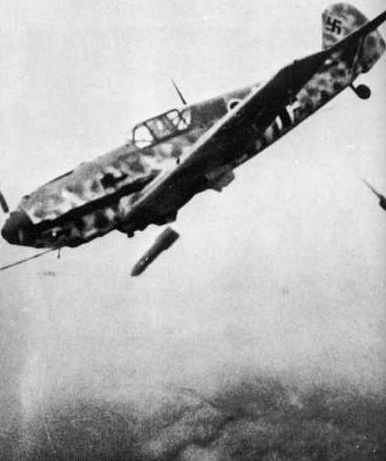 However it cannot be understated enough that with the proper backing of the fanbase in its entirety would do extraordinary things for World War II Online. This can be achieved by upgrading your subscription to a Premium or even a Hero Builder tier. I hope my words are being read clearly and you’ll do you part to join this incredible mission of bringing WWII Online to its future that we’ve been plotting for sometime. We know we have lots of work to do and there’s never going to be a moment of perfection. But you can count on our team at Cornered Rat Software to continue what it has demonstrated over the last year, and that is: DELIVER. So consider backing us up for an extended period of time and giving us the proper tools to do the job even better. 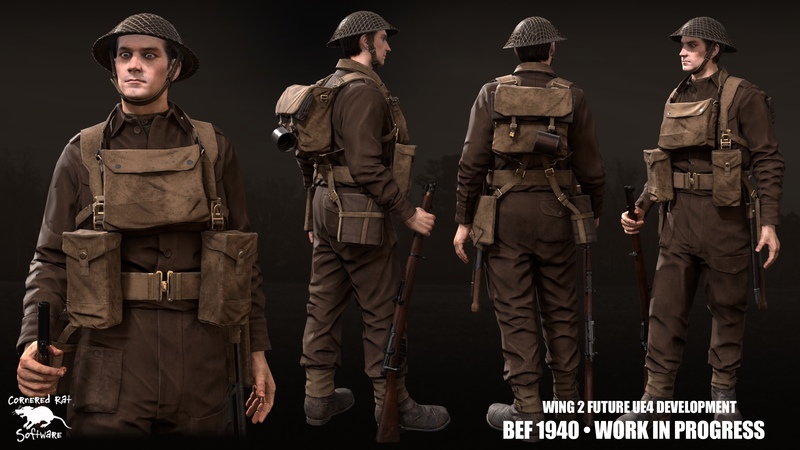 Upgrade your subscription now by going to http://www.wwiionline.com/account, and if you need any help the support guys are waiting for you at http://support.wwiionline.com. If you’ve made it this far, I want to thank you for all that you’ve done over the years. It has been a tremendous blessing for this team of die hard WWII Online fans, we do not take it for granted for even a moment. Let’s have an awesome year and remember that we’re in this together, Allied or Axis, CRS or Player, we are all part of the WWII Online family and we all have to do our part to push this wonderful dream forward. SALUTE – SEE YOU IN THE FIELD SOLDIERS!